For more than 350 years, the Pinson family has produced wine. Laurent and Christophe Pinson, worthy successors of their grandfather Louis, continue the family tradition, which began in 1640, date of the first official documents preserved by the family. 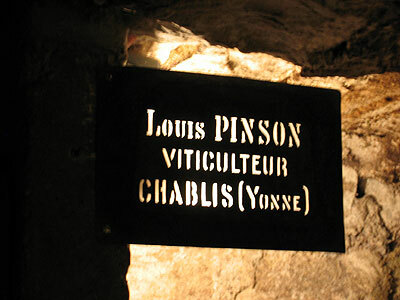 In 1940, Louis Pinson and his wife were one of the first wine growers in Chablis to bottle and sell their wines direct to the public. 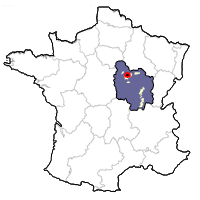 At that time, the domaine had a surface of approximately three hectares, and reached five hectares in 1982. Of course, the quality of the raw material is of primary importance, and the Pinsons work hard in the vineyard throughout the season. From pruning the vine to the all important grape harvest, all the vineyard work is carried out with the greatest of care, so thatChardonnay gives the maximum of its potential. Before the winter pruning, which begins around the end of November, they provide their vines with 100% organic compost, in order to reinforce their soils in humus and furnish the vine with the correct nutrients and rock salt necessary for growth. The soil is plowed between 50% of their vines one year, and 50% the following year. At the end of March/beginning of April, the vines are pruned. This work is not carried out too early, because the severe spring frosts can burn the young growths, which carry the grapes. However, certain vineyards have a heat burners to protect the future harvest. The HarvestWith the vineyard work finished, Domaine Pinson prepares its grape harvest carefully, because all must be implemented so that the grapes arrive at the pressing room under the best conditions. Before this starts, each vineyard will have been visited, and samples taken away to measure the potential alcohol as well as the level of acidity. 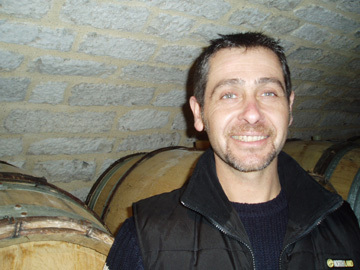 The harvest will take place as soon as the maturity of the grapes is at their optimum. All of the grapes on the property are hand-harvested. 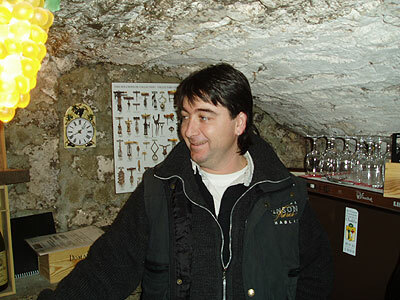 For the harvest, they employ approximately 50 people, which varies from eight to 10 days depending on the vintage. The grapes are thus brought whole to the press room, where they practice an enzyme addition, necessary for the first juice clarification. The grapes are immediately pressed using pneumatic presses, which are the most advanced machines to extract the best juices. Indeed the best juice comes from a soft press (from 200 G to 2 kg). This practice preserves the quality of the musts, and avoids the herbaceous tastes, which one can obtain with the traditional presses. After the pressing is completed, the clear juices are separated from the first lees (static settling). This operation happens naturally, because the lees settle for 12-18 hours after the initial pressing and fall to the bottom of the tank. Yeasts are then added to the musts, in order to start the alcoholic fermentation. During this procedure, a control is carried out each morning and evening to observe the evolution of the fermentattion and the temperature. If the temperature increases in an excessive way, the tanks are cooled with a special water-cooling system. 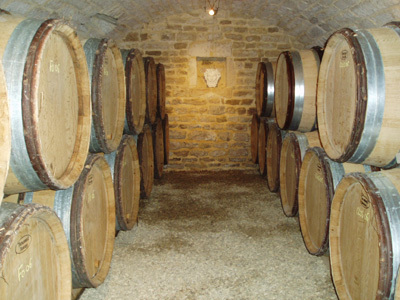 Once the alcoholic fermentation is completed, the second natural fermentation is carried out: the malolactic fermentation, which consists of transforming the "hard" acids (malic acid) into more "soft" acids (lactic acid). 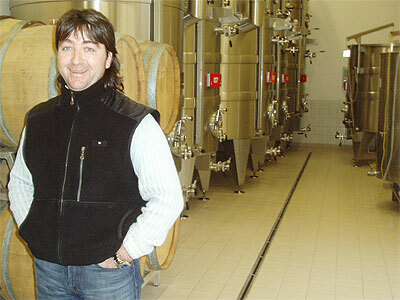 For this operation, it is necessary to maintain the temperature of the wine between 18°C and 20°C. This fermentation is usually completed by the end of January/beginning of February. With both fermentations now complete the first rackings are started. 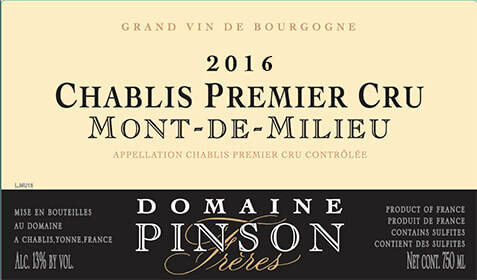 The Premier Cru and Grands Cru wines are then matured in oak barrels, on fine lees, for 6 months, whereas the Chablis "Village" remains in tank. 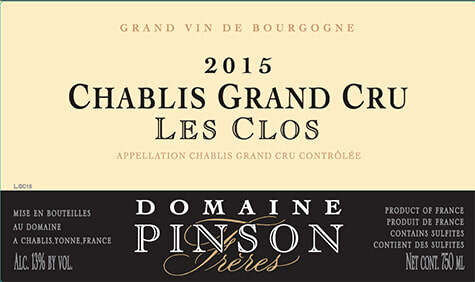 The Chablis "Village" is then bottled in May/June. After the Premier and Grand Crus wines have matured (August), they are racked, fined, and lightly filtered before their bottling (September). 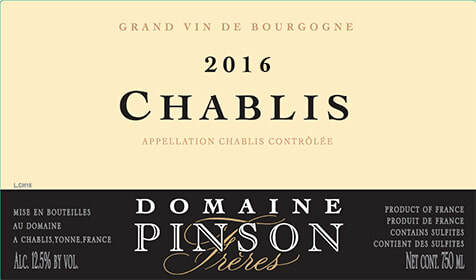 Chablis AOC1.87 ha (4.6 acres) from parcels very close to Mont de Milieu, 15-year-old vines, 85% left side and 15% right side of the Serein River, marls and calcareous clay from the Kimmeridgian period. East and north east exposure, 100% alcoholic and malolactic fermentation in stainless steel. Aged sur lie in tank for four months. First bottling 6-7 months after the harvest. Food Match: Seafood, fish, sliced pork, terrines, snails. Tasting Notes: Exotic aromas of pineapple and lime. Additional notes of honey and flowers on the palate. Good weight and texture for an AOC wine. Hints of grapefruit on the finish. 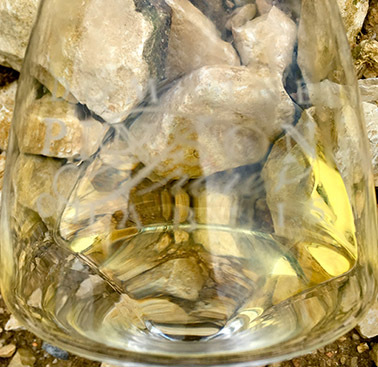 4.75 ha, 25-year-old vines, marls and calcareous clay from the Kimmeridgian period. South, south east exposure, fermentation and malolactic in stainless steel, matured on its lees in 3-to-6-year-old oak casks (228 liters) for six months. Bottled 12 months after the harvest. Food Matches: Fish with sauce, white meat with cream, ham off the bone with a chablisienne sauce. Tasting Notes: Exotic aromas of pineapple, vanilla, and apricot on the nose. Round, well-balanced, and with good persistence of flavor. 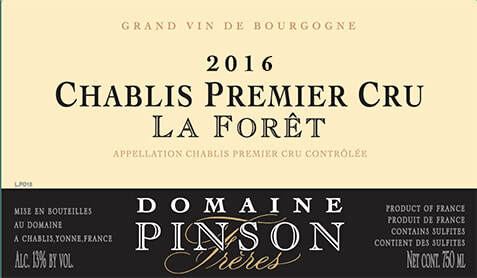 Domaine Pinson Frères Chablis 1er Cru La Foret. 68 hectare, 45-year-old vines, marls and calcareous clay from the Kimmeridgian period. East and south east exposure. 100% alcoholic and malolactic fermentation in stainless steel. Matured on its lees in 3-to-6-year-old 228-liter oak casks for six months. Bottled 10 months after the harvest. Food Matches: Shellfish, fish, cooked oysters, terrines. Tasting Notes: Pale Gold. Lots of pineapple and ripe grapefruit on the nose. Very ripe. Classy! Even with such maturity, still seems tightly wound. Soft, creamy, and exotic on the palate and with excellent potential. 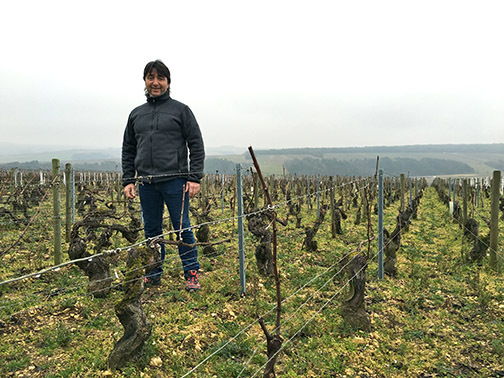 2.57 ha (6.35 acres), 30-year-old vines, direct southern exposure, alcoholic and malolactic fermentation in stainless steel for 90%, 10% in new oak casks. Assemblage and aging on lees in 228-liter oak casks for six months. Bottled 12 months after the harvest. Food Matches: Fish in rich sauce, lobster, foie gras, white meats with cream sauce. Tasting Notes: Pineapple, apricot, and preserved lemons on the nose. Notes of grapefruit pith and vanilla on the palate, framed by bright acidity. Palate staining and rich, and with wonderful length.